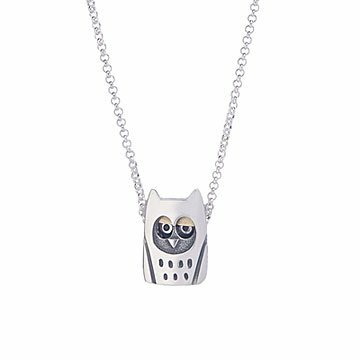 Alan Ardiff's sterling silver owl necklace blinks as you move, showing off gold eyelids. Owls are known for their keen sight and quiet flight, but even they need to take breaks from soaring majestically to rest their wings and eyes. Alan Ardiff gives his sterling silver owl pendant a place to perch in this handcrafted jewelry design. It's a good thing, too: The little guy can barely keep his eyes open. (It's hard work being so wise.) Thanks to hidden gears and a little kinetic energy, the bird's 18-karat gold eyelids blink as the wearer moves. It's a charming way to add a fun touch to your daytime outfits, or pair it with evening wear next time you're playing the night owl. Handmade in Dublin, Ireland. Pendant: .8" L x .6" W x .2" H Chain" 18"